Multiculturalism Around the World: International Perspectives Packs the House to Raise Funds for the Victims of the Earthquake in Abruzzo and the Italian-Canadian Museum. The show featured Sabrina Di Marco who both produced and shared observations, stories, and song from her travels illustrating the dynamics of multicultural models in countries such as: Sri Lanka, Brazil, Italy, Guyana, and Canada. Sabrina was accompanied by friends: Oriental Dancer Chemagne Martin of Chemagne Dance and Operatic Tenor Anthony Macri. Sabrina’s own biculturalism was represented as the show opened with members of the Commonwealth of Dominica Ontario Association dressed in traditional wop dwiet, and the Italian military Berseglieri, Caribinieri, and Alpinini dressed in uniform. 120 audience members were welcomed by all three levels of government and community leaders who now serve as: Minister of Culture and Immigration for Ontario, Mayor for the City of Vaughan, and Vaughan’s Regional Councillor. Refreshments were offered by many of the show’s invaluable sponsors. All was captured and shared with the community by local print and television media in attendance throughout the performance. The Case of the Italian-Canadian Museum is Presented during the Project Vaughan 2 Conference at York University. The experiences of this young museum were shared at the conference entitled Connecting Communities; Culture, Citizenship, and Participation. The conference was co-produced by: Mariano A. Elia Chair in Italian-Canadian Studies, Founder’s College, York University, and the City of Vaughan. Vice-President of the Museum, Sabrina Di Marco, and its Curator/Manager, Lucy Di Pietro, presented the Italian-Canadian Museum’s achievements, challenges and opportunities ahead. It compared and contrasted against other culturally driven museums such as the: the Ontario Jewish Archives, the Ukrainian Museum, St. Mark’s Coptic Museum, the Gendai Gallery at the Japanese Canadian Cultural Centre, the Chinese Cultural Centre of Greater Toronto, and the Canadian Museum of Hindu Civilization. Download the Project Vaughan PDF here! The Voice of Immigration’s Second Generation is reported at the Project Vaughan Conference. Sabrina presented early work on a paper she is co-authouring with Francie Romano; The Second Generation: An Evolution in Culture. The conference was produced by the Mariano A. Elia Chair in Italian-Canadian Studies at York University and hosted by Councillor Tony Carella of the City of Vaughan. 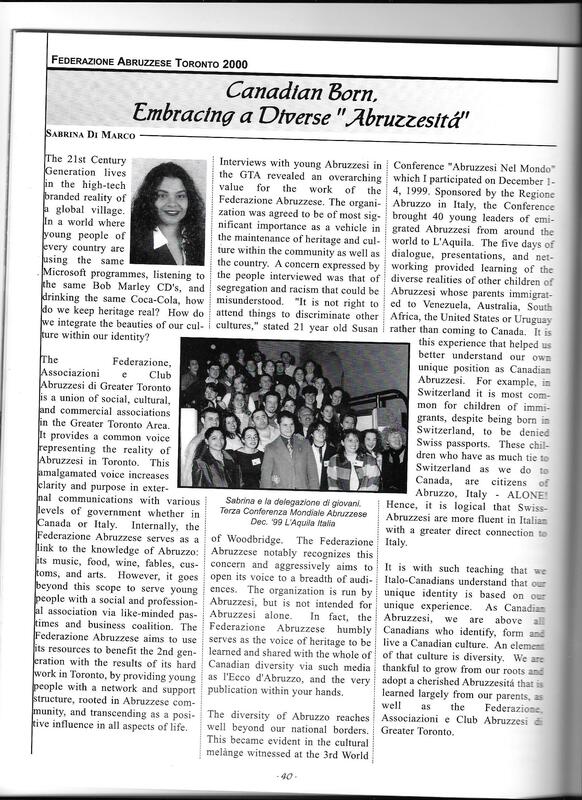 Canadians born from Italian parents are becoming increasingly responsible for the future of the Italian culture in Canada. They are being called upon to define the next iteration of Italian-Canadian identity and how successive contributions and status will continue to be made and enjoyed. The Vaughan community of Italians has nurtured them with excellence in areas including: entrepreneurship, politics, the arts, and media. Their lineage is descendent from a group of hard-working, fun-loving, and family-oriented people. What will be said of the achievements and character of the second generation? Over the past 20 years Vaughan has become the primary venue for Italian-Canadian life, wherein Italian immigrants have built an intricate web of businesses, social clubs, bocce teams, and influence. How will these efforts continue to survive with their successors? What traditions will be kept? In what ways will the community come together and in what ways will it contribute to this dynamic country? Using a Vaughan/Italian community lens, this paper will discuss the existing structures that propagate the Italian-Canadian culture. While fully recognizing the emotional connections to ancestry, language, and land that permeate any discussion of culture, the paper will address domestic configurations for: the arts, business associations, political representation, media, and mentorship. It will also confer upon the current relationship between Italy and Italo-Canadians. Such ties include: voting rights, real estate interests, trade, tourism and study, and municipal recognitions. Click here to view the event PDF. Sabrina Discusses the Power of Sending Money Back Home at the Inter-American Development Bank’s (Multilateral Investment Fund) Conference. Remittances have become a key source of capital for many developing countries; receiving US$150 billion in 2004 from their expatriates. These funds surpass the aid provided by donor nations and multilateral agencies. The event was organized by the Washington DC-based Inter-American Development Bank’s Multilateral Investment Fund in collaboration with the Canadian Foundation for the Americas. The MIF, IDRC, and CIDA financed research for the conference. Sabrina presented results from research she conducted of the Haitian Diaspora in Canada with her colleagues Pierre Renaud and Gaetan Tremblay. CIDA financed the original research to inform the Government of Canada’s position on the roe of the Diaspora in the reconstruction of Haiti for the 2004 Conference with Prime Ministers Paul Martin and Gérard Latortue. South African Businesses Learn Avenues for Doing Business in Canada. On behalf of the South African Trade Commission, Sabrina welcomed approximately 30 South African small and medium sized business entrepreneurs in the cosmetics and related industries to the prospects of developing trade relationships with Canadian companies. Image: Kiran pls use stock pic of a lipstick or something cosmetic. Maybe a map of SA. California-based USAID-Funded Microfinance NGO Plans for Financial Self-Sufficiency. San Francisco-based Net Impact, originally Students for Responsible Business, is a non profit membership organization for business school students and professionals interested in using business skills in support of various social and environmental causes. It supports over 300 autonomous volunteer-run chapters and a membership base of over 100,000. Its programs and networking events are centred on topics such as: corporate social responsibility, social entrepreneurship, non-profit management, international development, and environmental sustainability. After participating in the previous year’s conference at Yale University, and working within its Net Impact’s summer programming, Sabrina was invited to share her experiences and present the finding of her work with Katalysis Microfinance Partnership. The organization sought to anticipate expected declines in its traditional funding sources. It engaged Sabrina’s strategic and business planning, and research skills toward the inclusion of alternative revenue sources from its regular programming within its strategic and business panning. Sabrina shared these results, “The Evolution to Self-Sufficiency: Strategic Planning at a USAID funded Microfinance Organization,” with the Net Impact community at the Annual Conference, in 1999 held at the Michigan University Business School. On behalf of her teammates, Sabrina presented the voice of the Italian-Canadian experience, in Italian, to national teams of children of Abruzzese emigrants and general conference attendees at the Abruzzese nel mondo Confernce. Team Italian-Canadian was comprised of Di Marco, S. Di Stephano A. (co-presenter), Di Marino, L. Tiberi, A. Del Conte, C., representing diverse regions of Canada. Listening to the experienes of diverse national teams, the audience was able to recognize how policy, geogrpahy, and resources affected the connection that the second generation had with thier Abruzzese culture and Abruzzo. Click here for an article in Italian regarding this event.